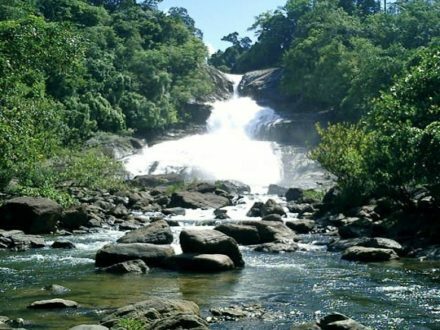 Dunhinda is one of the mostly spoken-about waterfalls in Sri Lanka. 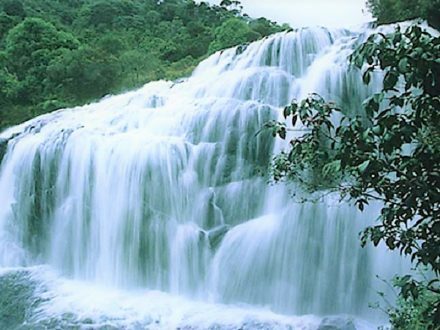 Although she couldn’t come even close to the highest waterfalls of the planet in height she rivals many of them when it comes to the natural beauty that it bestows on the environment . 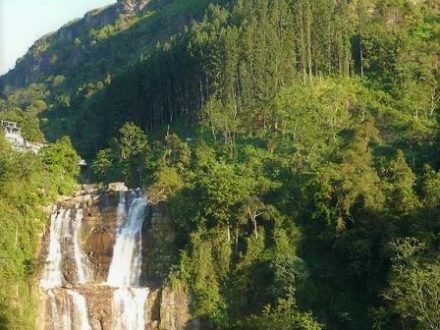 Situated about 2 km distance from the main road which runs to Taldena from the remote city Badulla in the Uva Province this is easily accesible and frequently visited by local and foreign visitors. 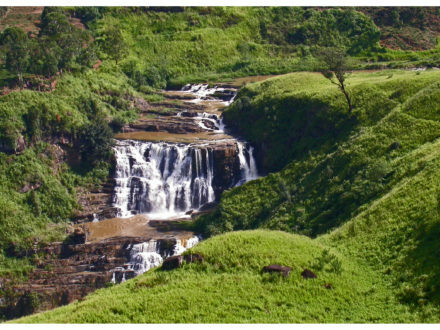 On the way can be seen the “Kuda Dunhinda” ( “Kuda” means small in Sinhala ) which is the prologue to its mighty brother . 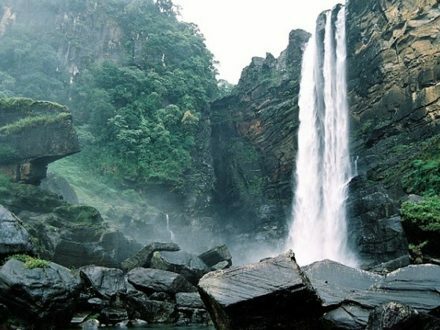 In native tongue “Dun” means mist or vapour which is the ideal explanation for a waterfall creating wreathes of mist on its way down. Dunhida Falls there is a small car park on a bend in the road about 2km from the falls, north of town, which takes about 25 minutes on foot (you may have to pay for the car to be guarded). Buses also stop nearby (about 10 minutes walk away). The path to falls is across the road from the car park. 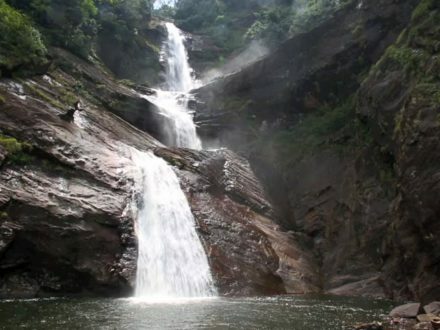 It is quite rough and steep in places, so take care and wear suitable shoes. The valley at this point is also quite narrow which can make it very hot.. 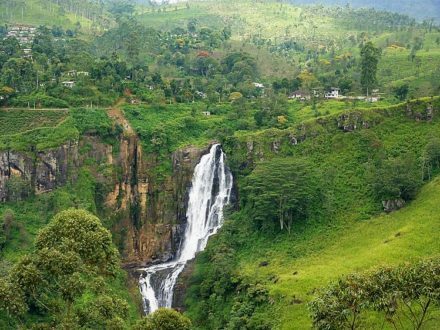 The humidity is also very high near the falls, which is noticeable if you have come down from is also very high near the falls, which is noticeable if you have come down from the high lands. Numerous stalls sell cold drinks, herbs etc at the start of the walk and along it. 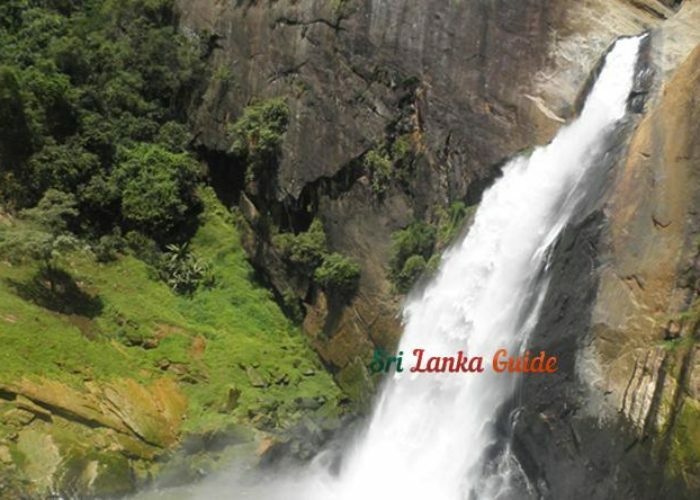 As the falls are very popular with Sri Lankans, foreign travelers are not hassled too much. Shortly after the beginning of the path you can see the lower falls (more of a cascade really). Quite a long way down in the valley below. 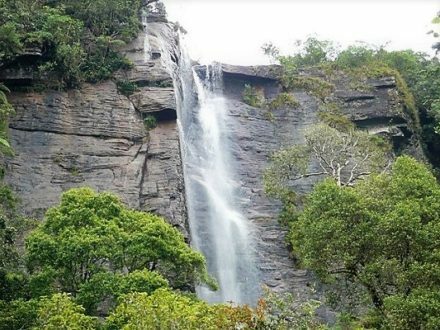 Thee are only about 15 m in height and much broader than the main falls. A ledge about 10m from the top makes for a pectacular ‘Spurt’ when the river I running high. 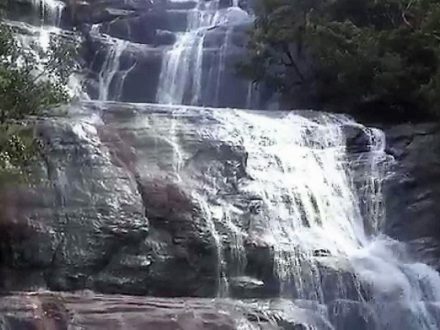 At the main falls, the river plunges in two tages about 60m through ‘V’ in the rock which caues a mity haze (Dunhida) which gives the fall its name. 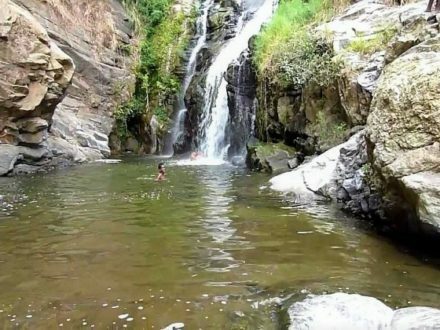 There are granite cliffs on either side and a large pool at the bottom. It is quite pectacular and well worth the effort. Here there is alo a large, Kidney haped obervation platform where concrete table and benches have been built to give a pleaant picnic spot. It can, however, be very buy at times. 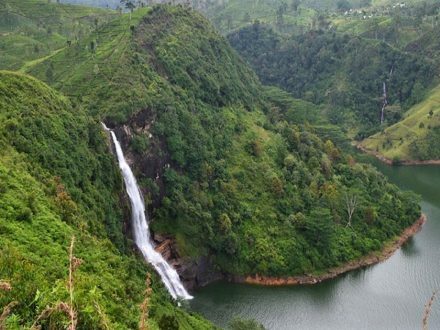 3.5 km north of Badulla lie the majestic, 63-meter-high Dunhinda Falls, reached via a beautiful drive from town. A huge archway proclaims the existence of the falls. We are into the car park. 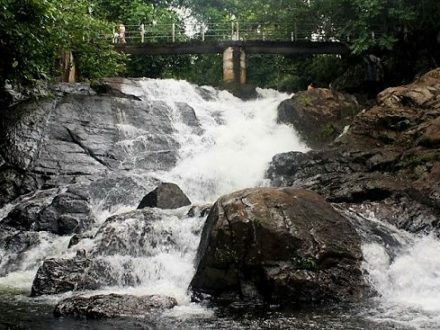 Now is the pleasant 1.5km scramble along a well worn jungle trek during which we cross a wobbly, Indiana Johnes-style suspension bridge & clamber over jagged rock, past stall selling snakes & herbal teas to reach the viewing platform. 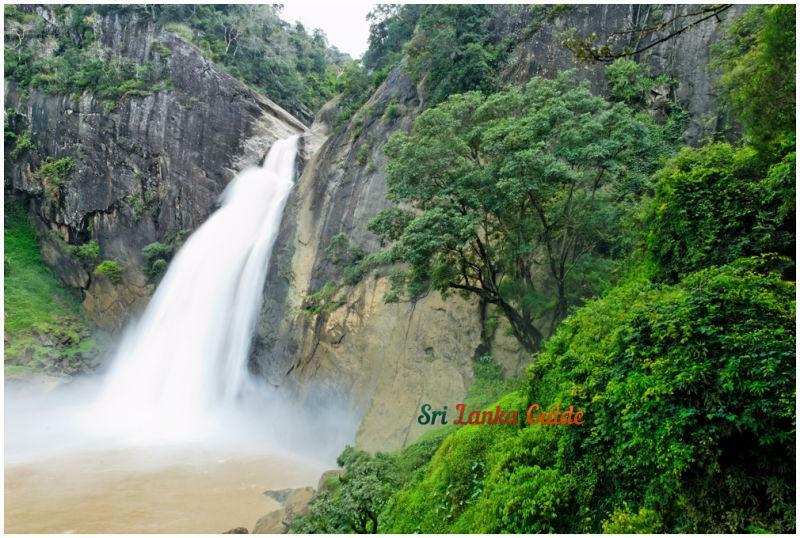 The falls are fed by Badulla Oya, a tributary of River Mahaweli. 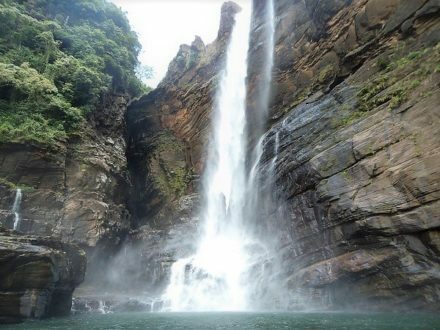 Though the falls are not the highest in the island, in fact are seventh highest, renowned for their sheer volume, spewing out an impressive quantity of water which creates great clouds of spray as it crashes into the pool below spraying us too on the viewing platform. 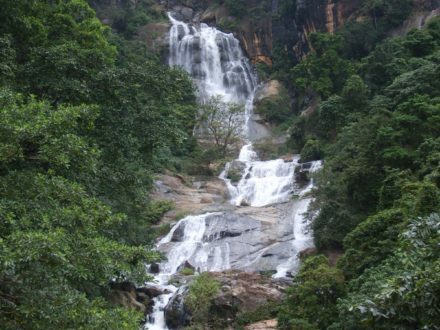 Dunhida, in Sinhala means spray. 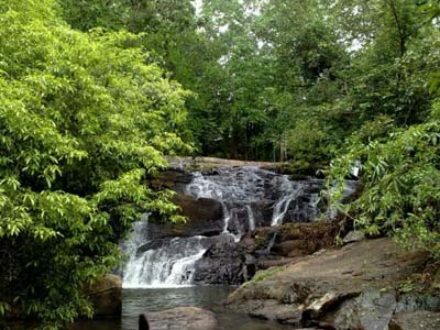 In the 14th century, Princess Mampitiya Anuhas Menike Bandara fled with her lover, the commoner Kahapitiya Arachchi Bandara, from the wrath of her father, the ruler of Gampola. Frustrated by the inability to erase tracks & traces of wherever they found refugee, the lovers, pledging their eternal love, plunged themselves into the depths of the pool. It is said following their tragedy, more tragedy fell upon the surrounding villages: a terrible storm swept away whole villages including Kosgolla, together with people, cattle, poultry & all. 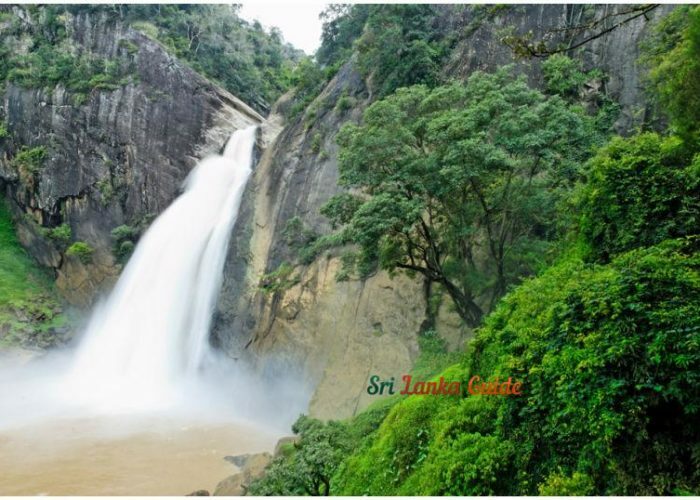 The name of the princess “Anuhas” in Sinhalese means supernatural powers. 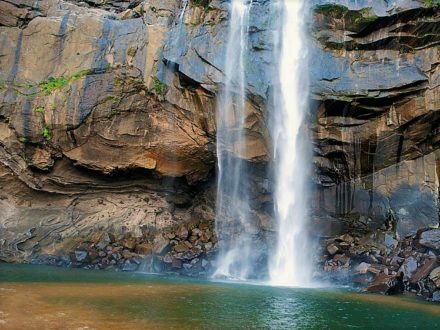 Another legend is associated with an entrance to a secret 30 km long passageway hidden by the falls. 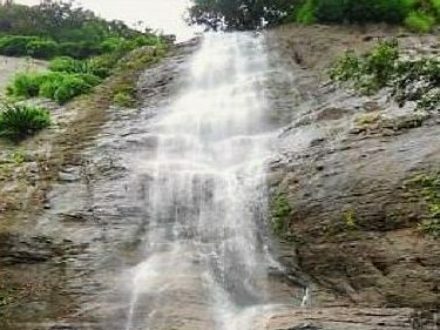 Treasure of Prince Kumarasinghe of Uva lies hidden somewhere in the falls.